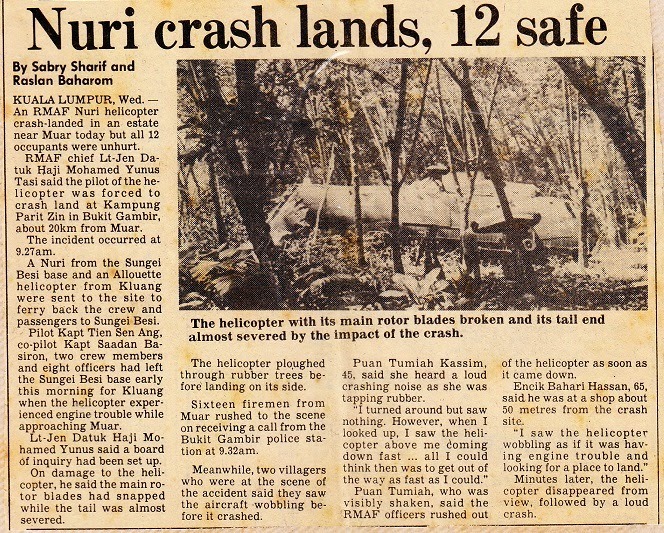 On the 16th January 1991, I took over Nuri helicopter M23-12 from Capt Ravinder who did a VIP flight in the morning. My task was a comm flight to Singapore. We took off from Sempang (RMAF KL) after lunch with 12 POB for Singapore. At the same time I was doing a Standard Checked on Capt Saadan, who was a D Cat captain who did a conversion from Alloutte captain to Nuri Captain and my crewman was Sjn Gobi Raja. I was on the Left seat. Initially, en-route weather was good and we cruised at 3000’. After Seremban, weather started to come in, cloud started to build up. We had to descend to 2000’ to maintain VMC. As we passed a beam of Malacca, weather got worse; we slowly had to descend further to about 1000’ or below to maintain VMC. 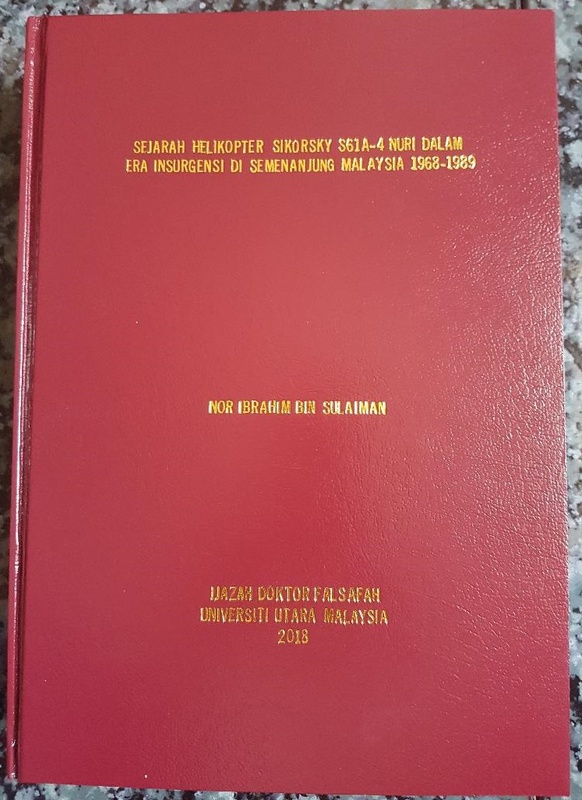 As we passed a beam of Muar over Bukit Gambir, suddenly there was a very loud “bang”, as if the aircraft was being shot at and the aircraft immediately went into very severe vibrations, I reduced speed and lowered the collective quickly to autorotate. Aircraft vibrations were so severed, all the caution and advisory lights came on and off, it was like Christmas tree and then all the controls became very hard. Aircraft started to roll to the left, the retreating side and diving down. I told Capt Saadan to follow me through on the controls as we tried to level the aircraft. As we were going down, we only saw the ground. We saw the trunk road, a school field and rubber estate. As the vibrations were so severed and the controls were hard over, I decided to go for rubber estate for the landing as it can cushion the impact. Just before we crashed land the aircraft, suddenly we saw a row of houses in the rubber estate in front of us, we quickly pulled the cyclic to the right and aft as hard as we can to flare the aircraft to avoid those houses and reduce the rate of descend to cushion the landing. The aircraft responded and ………we saw the sky. We just continued to pull on all the controls very hard before we crashed to cushion the landing. While going down, there was a fast flash back of my life in my mind until the aircraft crashed and the flash back stopped. (Later I checked with Capt Saadan and Sjn Gobi Raja, they also experienced the same thing). As we crashed through the rubber trees, I covered my face with my hands and closed my eyes for the impact. Aircraft came to a sudden stopped; I opened my eyes and saw the windscreen cracked and can’t belief that I am still alive. And I looked at Capt Saadan, he also was alive. I quickly pulled both the speed levers back to shut off and shout for evacuation. As I looked back to the cabin, I only saw Maj Azmi, our Officer mess PMC /OC admin of KL Base still trying to climb the steps on the front passenger door to get out. All the other passengers had evacuated. I jumped out from my seat, and then pushed Maj Azmi out off the aircraft and shout at Capt Saadan to get out, but he was still jumping up and down on his seat as he forgot to unbuckle his seat belt. I shouted at him “buka seat belt”, he did as told, and then he evacuated from the aircraft. After evacuated the aircraft, I briefly checked around the wreckage and did a roll call for all on board and checked whether anyone was injured. It was a great surprised that none of the passengers was injured except my crewman Sjn Gobi Rajah, his palm has a cut because he was thrown forward to my seat, left seat; which has a weapon rack installed for crew’s weapons storage during the impact. He was thrown forward because he was on a monkey harness. He walked around to ensure everyone was strapped in before the impact (He did a very good job to ensure every passenger were strap in. A few of the passengers who were aircrew help him out as well to ensure all were strapped in), and I had a back pained. After the roll called and checking on injury, I walked round the crashed aircraft again which was leaning against a tree to check on the damages in more details. I found the tail section was broken; four Main Rotor Blades broken and left with the root ends only with some part of the blade sleeve and another blade still intact at the rotor hub, but the rotor hub already opened up. The blade was without part of blade tip section. Both engines cracked and oil was leaking out. 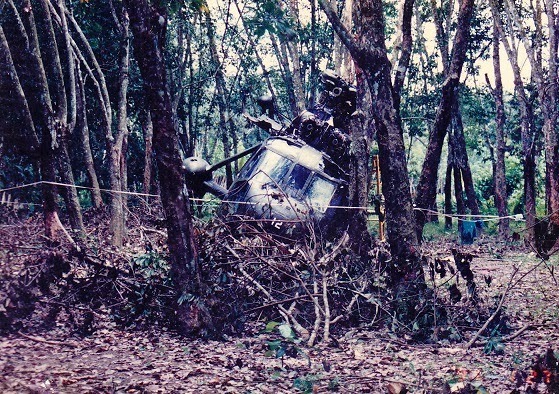 Left undercarriage collapsed as the aircraft landed on the left side. One small tree stump pock through from the bottom of the left side and hit the bottom of the left seat (Luckily it was an armoured chair, if not my back side “kena sula”). Whole aircraft was badly damaged. After assessing the situation, I and my crew sat down for discussion for the next plan of actions. During the discussion, I said, “all of us survived”; all started to smile. I told them my next action plan. (During the discussion, I took a stick of cigarette from Sjn Gobi which he offered me and started to smoke, my first cigarette in 5 years as I had stopped smoking for 5 years). I went to the nearest house, a Chinese rubber tapper’s house to ask whether they have any house phone which I can make calls to 10 Squadron. The house owner was very helpful, told me to use the phone and offer us drinks as well. I called up 10 Squadron Ops room. WO Mohana answered the called and I told him “I just survived a crashed, all on board are safe, and we need the SAR aircraft”. I think he was shocked and disbelieved, he asked me whether I am joking. I told him no, I am not joking. He then asked again, “how was the aircraft?” I told him, “it’s a complete write off.’ Then I passed him the coordinates, contact number of the Chinese small holder and told him to inform POTU. Not too long after I made the phone call, a Police Range Rover came by (I think the kampong people must have informed the polis station about the crash) and asked what happened? I told the policemen we just crashed and I need to go to the police station to make a report, and also make a report to POTU as well. After making the police report, we came back to the crashed side and waited for the rescue team or the SAR aircraft. About this time, some reporters and the kampong people had arrived at the crashed side and I have to stop them from taking pictures of the crashed aircraft. About an hour plus after the crashed, the first SAR aircraft to arrive was from TUDM Kluang led by its Commandant, Lt Col (U) Goh Seng Toh, and the second SAR aircraft was from 10 Squadron led by Lt Col (U) Affendi Mustapha, which arrived about half an hour later. I handed over the crashed aircraft to Lt Col (U) Affendi, CO of 10 Squadron. Later, all of us were airlifted back to KL base and send to IAM for medical checked up. Capt Tien Sen An PTU....Thank you. Thank you for sharing, Capt Tien. are there more pictures of the crash?.